India and Tajikistan, both located in the proximity of the "main source of terror", on Monday pledged to further deepen their cooperation to fight the menace and agreed to step up defence ties besides boosting trade and investment. During the wide-ranging talks between Modi, who was in Dushanbe on the last leg of his eight-day six-nation tour, and Tajik President Emomali Rahamon, the two sides pitched for taking the ties to newer heights in diverse areas. Modi, who flew into the Tajik capital from Kyrgyzstan on Sunday night, was accorded a ceremonial reception before getting into one-on-one and delegation-level talks with Rahamon. "We are located in the proximity of the main source of terrorism," the prime minister said after the talks at a joint media appearance with Rahamon, in an apparent reference to Pakistan and Afghanistan. "At a time of growing threat of terrorism, we have resolved to intensify our cooperation further," he added. "Combating terrorism and extremism has always been an important and productive area of cooperation," he said. Modi said the two sides also decided to further strengthen the defence cooperation, which he described as a "strong pillar of our strategic partnership". 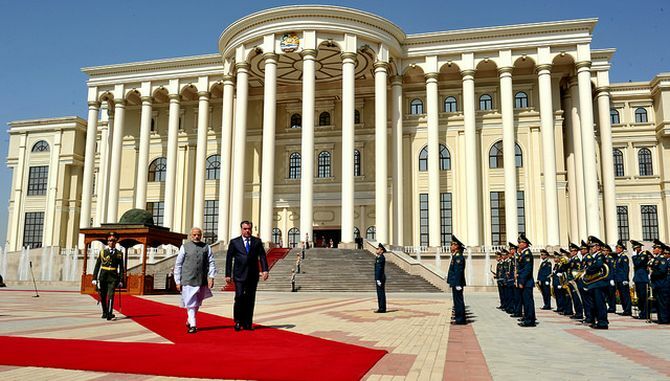 Turning to Afghanistan where India has strategic interests and with which Tajikistan shares border, the prime minister said the two countries support the aspirations of the people of Afghanistan for a "peaceful, stable, prosperous country". 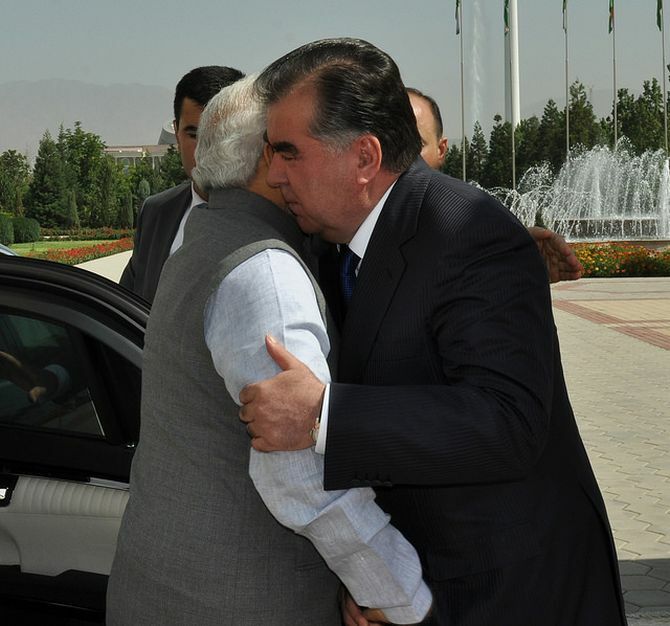 He said India and Tajikistan have deep interest in shared security and prosperity of the region. 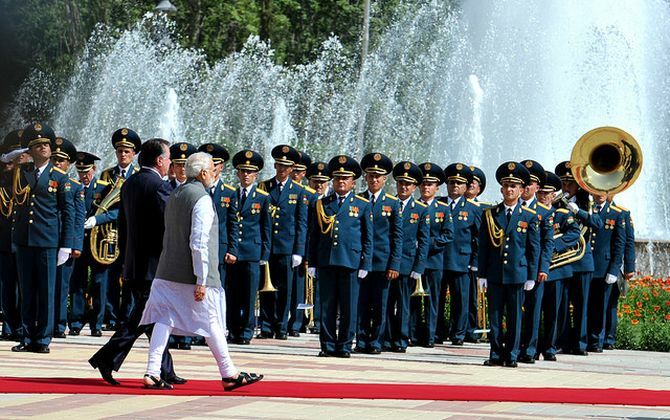 The two leaders also discussed ways to enhance connectivity between India and Tajikistan and in this context they agreed to promote the International North-South Transport Corridor, which proposes to link Central Asia with South Asia. "Tajikistan is nearest to India among all Central Asian countries. We are separated by a narrow corridor.... Connectivity is vital for realising the full potential of trade and commerce between our countries," Modi said. He said other connectivity measures in the region will strengthen links and mentioned Chahbahar port of Iran which is being built with Indian investments. The prime minister said they also talked about measures to tap the rich potential in trade and commerce and to encourage joint ventures and investments. "The joint commission will meet soon to finalise the roadmap for the future," he added. He said agriculture is important for both India and Tajikistan and the two countries will cooperate in this sector. He said he also conveyed his appreciation to the Tajik president for his country's continued support for India's candidature for permanent membership of UNSC. Referring to grant of membership to India last week in the Shanghai Cooperation Organisation of which Tajikistan is a member, the prime minister said it add a new dimension to India-Tajikistan partnership. He presented Rahmon a specially-commissioned miniature painting of the tomb of the 17th century Indian poet Abdul Qadir Bedil who is regarded, especially in Tajikistan, as one the greatest masters of Persian poetry. Born in 1644 in Patna, Bedil was influenced by Sufism and wrote 16 books of poetry. Bedil died in Delhi where his tomb, Bagh-e-Bedil is located. The miniature painting has been done by national award-winning Delhi-based artist Jai Prakash. 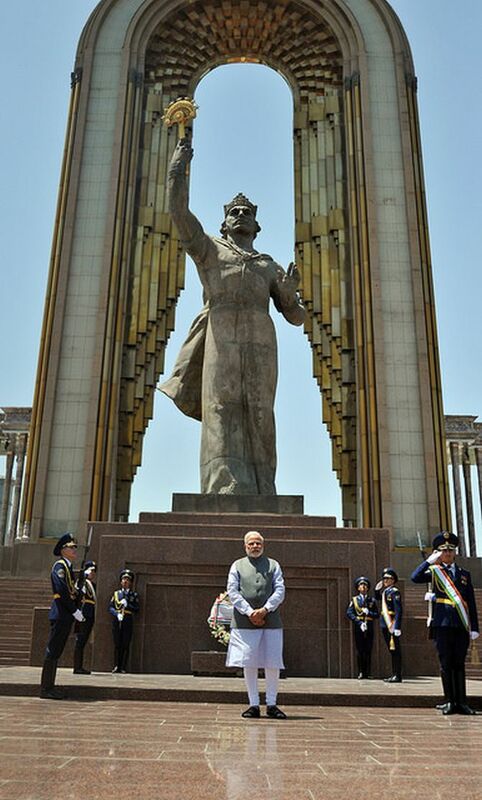 After the talks, Modi laid a wreath at the Ismaili Somoni Monument, built in the memory of the founder of Tajikistan. World's top crime boss escapes jail again!